How Fast Does Your PC Really Need to Be? Most computers are overpowered for what the average user will be doing with them. Because of this, it's important to take a hard look at what your PC will be used for before you buy one. The processor and RAM are two of the most important components when you're dealing with the swiftness of a computer. If you want an ultra-fast machine, then those two pieces of hardware should be looked at first and foremost. However, not every user needs to have a huge eight-core processor and 16 GB of memory. Most people can get by just fine with much less. Much like how newer computers come with 1 TB or more of hard drive space, and the vast majority of it ends up going unused before the hard drive fails, many computers have other system resources that aren't used as the computer sits idle for long periods of the day and as everyday programs utilize just a fraction of the hardware's capabilities. So, if you're wondering which processor to choose from when you're buying a new computer, and how large the memory sticks should be, in order to make your computer last as long as possible, then walk through this guide with us as we talk about these areas of the computer and how they work in various scenarios. This simple consideration can help save you a lot of money on your purchase and yet still give you a completely functional and pleasant experience that's tailored to your needs and not just a catch-all fast computer for all purposes, including ones that you'll never even take advantage of. Should You Upgrade or Replace Your Laptop? If that's the question, you're dealing with. You might be able to spend much less by just cleaning up your computer software or buying some relatively inexpensive external hardware, rather than buying a new computer with better specs. Lots of everyday tasks that the average computer user performs are so minimally hardware-intensive that the lowest-end processors in newer computers are plenty fast enough. Most people use a computer for internet-related things only. It might include sending and receiving email, browsing the web, checking and posting on social media networks, streaming media content, and other casual tasks. Those things might have been fairly hardware-demanding many years ago but have been greatly improved through more efficient programming and better standards. Additionally, many of these tasks might be restricted by the speed of your internet connection and aren't being limited by processing power. After all, most processors are much faster at dealing with data than the data can be transmitted to/from your ISP. Following internet connectivity, the next most common use of a PC is productivity. It would include writing up documents in a word processor, editing a spreadsheet, taking notes, putting together a presentation for school or work, etc. These tasks are primarily done by business users and students. These are some of the earliest forms of computer software for personal computers and has been greatly optimized over the years. Often the speed of these programs is limited more by how fast you can type or enter the data. What's more is that plenty of these offline applications (like Microsoft Word) now run online (e.g., Google Docs and Word Online), and the only real power you need when using them is a decent internet connection and a mouse and keyboard. Media viewing was somewhat mentioned in internet connectivity when it comes to streaming, but a lot of people use their computers for watching movies or listening to music that is stored either on physical media (CD or DVD) or locally as digital files (MP3 audio files, MPEG videos, etc.). Even with high definition video, computer hardware (the CPU, HDD, and RAM) has been optimized to handle the various standards that very little computing power is required to watch something like a 1080p HD video. In all of these cases, pretty much any modern personal computer should be able to deal with these quite well. There may be a few specific hardware requirements such as a Blu-ray drive to watch movies on a Bluray disc, but the hardware requirements are still quite low. While most people don't require a high-performance computer, there are still a few things that can bring a budget system to a dead stop, but this is only true for people who have a specified use for their computer beyond the simple ones described above. If your computer falls into any of the categories below, you might consider checking out the links at the bottom of this section for a faster computer. One of the highest process-demanding applications is in regards to video editing. A video, in general, can be very taxing but editing alone has to do some serious work, especially with the rise of HD video recording. The reason is that video editing requires that the computer calculate all the various frames one by one and then stitch them together along with an audio track - something that a low-end computer simply cannot perform, or at least cannot perform in a timely manner. As a result, a faster machine will reduce the amount of time it takes to generate the resulting edited video. In fact, lots of video editing tasks are much easier to deal with when you can see a live preview of the edits as you're editing. Why wait 30 minutes to play back the video to make sure it's edited the way you like, instead of just five? In addition to video editing, graphics creation and more specifically computer animation can also be quite demanding. It takes a fair amount of power, and therefore usually also a lot of time, to build a 3D model with all its polygons that comprise it. If you are then going to render those 3D models into a final image or scene, you're looking at requiring a lot more power than what a low-budget computer can offer, especially for some modes of rendering. There's a reason why a company like Pixar has huge banks of computers to produce its spectacular animated movies. Just like with video editing, a faster PC is capable of drastically shortening the total render time. Another demanding task that is fairly rare in the consumer PC market is called computer-aided design, or CAD. It is software that's used to build the designs for a wide range of products and buildings. CAD is demanding because it has to do a variety of computing dealing with the physical and material aspects to ensure that the design will function when it's finally assembled. It can involve a great deal of high-level math involving calculus and specific scientific formulas to ensure accuracy. As a result, a faster PC can help reduce the time it takes to verify a specific model. PC gaming has traditionally been something that has been very demanding of PC hardware. All the 3D graphics, audio, and AI can add up on a PC. The issue is that programming all of these items has become much more complex such that the hardware has outpaced what the developers have been able to put together. There are still some specific hardware requirements for the graphics to play many PC games, but frankly, there are many affordable options that can achieve the most common PC resolution of 1920x1080 just fine even with laptops that tend to have restricted performance from power constraints. There are still some instances where gamers would require a fair amount of performance to achieve an acceptable experience, and then it might be worth buying a dedicated PC gaming system. One such instance is running multiple monitors, like UltraHD (4k) displays, to achieve more screen real estate and get a larger high-resolution display. Gaming across three 24-inch monitors, for example, can be quite impressive but the hardware costs for setting it up are beyond what most people are even willing to spend on a single system. Because each of these computing tasks can require a large amount of computing power, it's highly recommended to avoid a low-end computer and shoot instead for something that can deal with these tasks head-on without locking up the computer or taking an extended period to complete what could be finished much faster. Below are some suggestions for desktops and laptops that are a good fit for some of these high-intensity requirements. 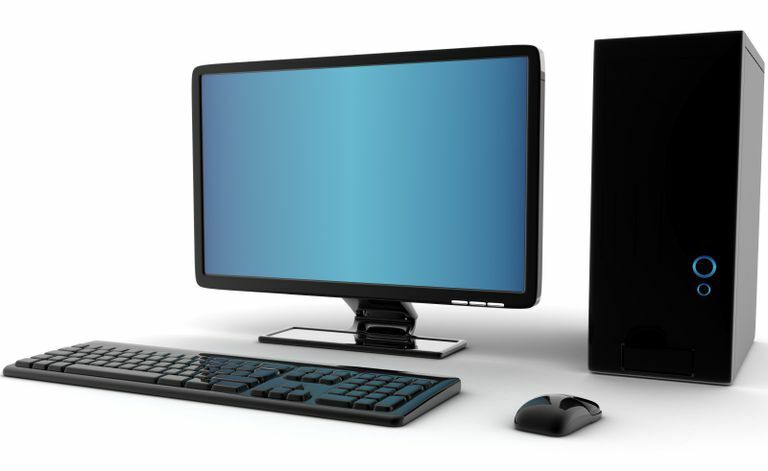 For example, you can find systems that have at least 8 GB of RAM and faster processing power than low-budget computers, which is plenty for most video games, as well as laptops that have large screens for CAD programming and video editing. What About Chromebooks and Tablets? Chromebooks are a popular alternative to a full PC these days thanks to their low price and portability. The thing to remember is that these systems often have less performance and capabilities than a traditional computer. Chromebooks are primarily designed for internet connectivity as mentioned above and do not support the same programs that you can find on a desktop or laptop computer. If you only need these capabilities without the need for compatibility with Windows software, full-fledged offline applications, etc., then it might be a suitable alternative. However, it's highly recommended to try one out before buying it since they have limited potential for upgrades. While it might be easy to add more RAM or upgrade the CPU or hard drive in a desktop computer, a Chromebook doesn't have that kind of flexibility. Tablets are also another alternative to a full computer. Their small profile and easy-to-use interface make them perfectly suited for tasks like video streaming, and there are often plenty of apps that help form a substitute for regular desktop programs. However, tablets are usually not as well suited for productivity purposes as a traditional laptop because of their touch interfaces. The best part is that they don't have the legacy software of the x86 architecture used by most PCs making them much more efficient. Performance is still a bit of an issue because of their limited resources. Going with the least expensive tablet is not always the best choice. Instead, it's recommended that you look at how you'll be using a tablet and then check out some suggestions from our Best Tablets to Buy list for one that matches your needs.